Jamyang Chopal was born in 1979. He learned basic Tibetan writing, Chinese and Mathematics at the age of nine till eleven. In the following year he embraced monastic life and learned reciting and chanting Buddhist liturgies. 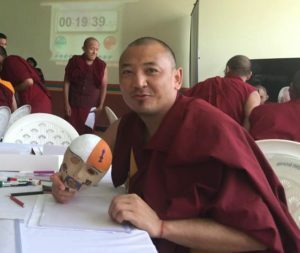 In 1999, he joined Dzongsar Shedra where he studied the Eighteen renowned scriptures including the auxiliary teachings and obtained Madyama degree, Shastra and Masters in 2002, 2005 and 2007 respectively. In 2013, he was awarded a Khenpo certificate. While he himself was studying in class 2, he also tutored a monk from Taiwan on Tibetan language and Buddhism as asked by late Khenchen. He was appointed as an assistant teacher in 2008 and as teacher in 2010 by Shedra administration and has been teaching continuously since then. He also served as the chant master in 2006 and and as Shedra secretary in 2012. Since 2015 he has been working as an examination supervisor in examination committee. In 2015, he went as tutor for H.E Sakya Dungsey Abaya Vajra Rinpoche and returned to Dzongsar Shedra the very year along with the H.E. Today, he teaches in the Shedra besides tutoring H.E Dungsey Rinpoche.